Ġanni’s art is one of fantasy, imagination, a romantic vision that runs riot that overflows with passion, feeling, emotion and sentiment. It is a dream world of fantasy, shadows, spirits and ghosts dancing like tongues of flame, inspired by folk art. He is a social realist with a heart of gold, with empathy and sympathy for suffering humanity, for the emarginated poor and dispossessed, for persons in distress. Ġanni is an expressionist who loves a rough texture and eroded, denuded and decadent shapes and forms. His forms are gouged, dented, pitted and contorted in the infinite process of concurrent dynamic growth and attendant deterioration, destruction and recycling. His forms capture light, reflect and refract it, a vital requisite in Impressionist sculpture. Ġanni’s mentors are Medardo Rosso (1855-1928) and Auguste Rodin (1840-1917). The former rather than the latter is Ġanni’s main inspiration. Medardo Rosso was instrumental in fusing sculpture and painting developing a love for wax with its inherent plasticity, softness and melting properties with a propensity for low relief and the ‘schiacciato’ or ‘pittorico’. A characteristic work carved in wood is ‘Unity’. Its rough, gouged texture resembles eddies that sea currents form on fine sandy beaches. 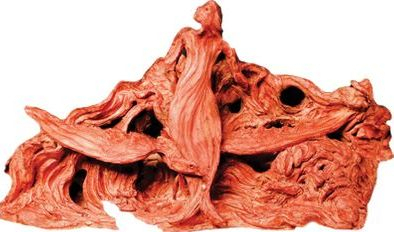 A repetitive undulating, vermicular wavy movement that is auxiliary to the torsion in the tree trunk. The two figures, a male and female form, unite in a dance of love. In ‘Surprise’ Ġanni crafts a crouched or squatting female figure a form much loved by the sculptor and often repeated for its romantic suggestive qualities. The movement of broken diagonals is quite impressive. Her ‘surprise’ is quite evident and explicit. ‘Arabesque’ in terracotta demonstrates Ġanni’s love for luxuriant vegetation, dancing seaweed in strong currents or a playful rhythm with line. Plastic, soft and malleable it underlines Ġanni’s preoccupation with weakening the structure of form thus removing the bones to achieve a sense of deterioration and decadence, a romantic predisposition. ‘Muse’ in limestone (franka) captures the face of the inspired artist in repeated profiles similar to Leonardo’s bearded features, scratched by a toothed claw chisel to achieve a patterned wavy rhythm. These four works are representative of the variety exhibited at the Auberge d’Italie (May, 2010) a collection of about 75 works in wood, stone, terracotta and gesso. In his vision and concept Ġanni reaches out to Josef Kalleya (1898-1998), Joseph Ġenuis (1939-70) and Toni Pace (1930-89). On a more practical level Ġanni has gained invaluable experience from Marco Montebello (1915-85) and John Spiteri Sacco (1907-96) by befriending them and frequenting their workshops and finally inheriting some of their tools. Ġanni has gradually assimilated their techniques but chose Josef Kalleya’s vision and concept: a traditional technique coupled with a mystic vision. Ġanni accepts commissions for statuary often larger than life, projects for public monuments and works of a religious nature. The most important to date are St. Dominic (2003) for the Dominican Sanctuary at Ġ’Manġia, St. Augustine (1987) for St. Augustine College, Pieta’, St. Andrew (1998) for San Andrea College ‘Ta’ l-Imselliet’, Mgarr and a public monument depicting children at play (2000) near St. Joseph School, Blata-l-Bajda, and another: ‘Support for Life’ (2005) at Mosta. Ġanni has also produced a portrait bust (2002) of Marco Montebello placed in the gardens at Qormi. To his credit Ġanni has a sculpture in support of the underprivileged and emarginated in society (2004) at the Millennium Chapel, Paceville. A vertical terracotta panel about 2metres high decorates the entrance hall of the Society of Christian Doctrine Centre at Blata-l-Bajda commemorating the life of the founder St. Ġorġ Preca (2008). Ġanni Pace was born in Valletta in 1946 and during his childhood observed his late father Joseph draw with loving care. His father was Ġanni’s mentor as a felt portrait demonstrates. This portrait of his father Joseph is undoubtedly one of Ġanni’s best works. He first modelled clay as a child on excursions with his family to Mdina. His father’s aunt used to make ‘pasturi’ that she sold from an outlet in Floriana. The ‘pastori’ or shepherds produced by his aunt were Gianni’s first impressions and possibly his inspiration for a naïve, rustic, humble, rough and primitive approach – the source of his folk art. Ġanni fuses eternal hope with a predilection for a streak of fatalism that is rather explicit. Ġanni studied at the Malta School of Art under George Borg (1906-83). During his childhood his parents often took Ġanni to the Upper Barrracca Garden to play. There he was struck by the wonderful statue of ‘Les Gavroches’ (1907) by Antonio Sciortino (1879-1947) in an Impressionist technique and the classic, low relief naval battle scene by Bertel Thorvaldsen (1770-1844) in the monument dedicated to Admiral Sir Henry Hotham (1834). He had never dreamt of being commissioned art works for this garden. Ġanni eventually was commissioned wall reliefs: the portrait of Marconi (1989) and Albert Einstein (1988) for this garden. Ġanni is humble, patient and unpretentious but conceals a kind heart, a romantic feeling, an expression of deep sentiment and emotion. As a social realist with an applied participation in voluntary social work Ġanni reveals a deep and acute understanding of people in distress. He expresses such experience in his art. Burning with zeal he is consumed by a feverish frenzy as he identifies with suffering humanity. Tortured and contorted with pain as reflected in his forms, he creates a labour of love, a rare music both simple and profound.